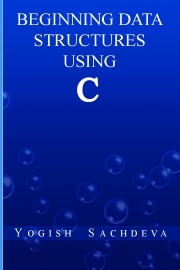 Description of "Beginning Data Structures Using C"
A beginner of the Data structures, who has some basic knowledge of C, could find this book interesting and simple. Every program has a proper step by step explanation of each line of code. It contains the practical implementation of stacks, queues, linked lists, trees, graphs, searching and sorting techniques. Also, recursion has been explained in an easy manner with the numerous examples. However if you find any mistake, or want to give some suggestions for the improvement of this book, then the same may be sent at 'sachdevayogish@yahoo.co.in', so that the mistakes may be rectified and the suggestions may be incorporated. My name is Yogish Sachdeva and I am the author of book “Beginning Data Structures Using C”. When I was doing MCA from Panjab University, Chandigarh, I had to search books on Data Structures through C for making preparation for examinations. Though this search led me to the selection of some good books on this subject, yet I could not find any book, which might have dealt with the Programming in such a manner, so that the students like me could do the same with ease. Thus it gave me an idea of writing a book on this subject, so that a learner of this subject may find the programming interesting. It is with this object in view, that an effort has been made to give proper explanations of the programs. I hope you will find this book very helpful in your studies. Reviews of "Beginning Data Structures Using C"